This chapter book, The Squatchicorns by Ellen Potter, tells a yarn just for that young reader who likes gentle, fantastic stories. Engaging illustrations by Felicita Sala bring it to life. 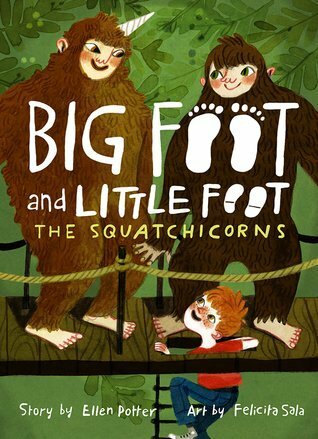 It’s the third book in a series about a friendship between a human boy, Boone, and a young Sasquatch, Hugo. As the story opens Hugo is playing in his cave apartment with his sister, when he receives a bottled message in a toy boat in the creek that runs through the cavern. It’s from Boone, inviting him to his birthday party at his cottage in the woods. But Hugo isn’t woods-savvy enough to get himself to the party. What’s he going to do? Enter some visitors who look a lot like furry Hugo and his sister, except that they have a single horn on their heads. They’ve escaped from their own cave because it seems it’s haunted. And they know the woods. A fun adventure with the young squatchicorn named Nogg ensues, complete with birthday party and a mystery to solve. This book was published in March 2019 by Amulet Books, which gave me a free copy of the book, no strings attached.